A cable car service, the third one in the country, has come into operation in religious and tourist spot in Kalinchowk at Dolakha. The test operation of the cable car was conducted before the Dashain festival and was commercially operated from today. With the operation of the cable car, trip to Kalinchowk has been made easier for the tourists and devotees visiting this place for a Goddess shrine named Kalicnhowk Bhagawati temple situated at the altitude of 3,755 metres from sea-level. 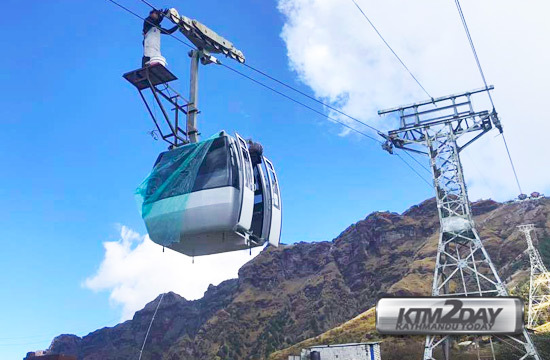 There are altogether four gondolas in the cable car services where ten persons can travel at a time, according to Kalinchwok Darshan Ltd.
Chief Executive Officer of Kalinchowk Darshan Ltd Ashok Shiwakoti shared that only one car has been brought into operation currently. The cable car service was constructed at the cost of Rs 450 million. The ticket for cable car is priced at Rs 500 per passenger. The locals of Kalinchowk, however, could enjoy the services with discount. Built with Swiss technology, the proprietors claimed that it is different from the one being operated at Manakamana and Chandragiri. 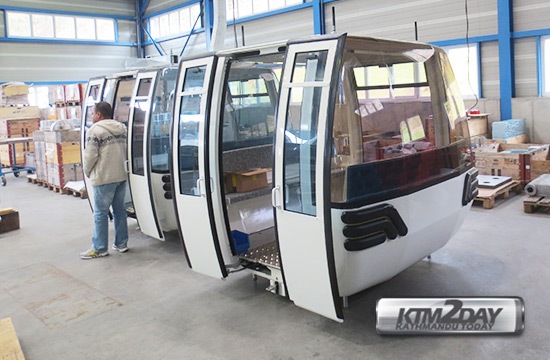 The operation of cable car is believed to contribute towards development of tourism in Dolakaha district. Kalinchowk Bhagwati Temple is a Hindu shrine in Dolkha District of Nepal. It is situated in Kalinchowk VDC in Dolkha at the altitude of 3755 m from sea-level. It lies in national forest area. On the top of Kalinchowk hill, in an open air space, there is a temple of Kalinchowk Bhagwati . Two major rivers Sun Koshi and Tama Koshi originate from this Kalinchowk Hill.